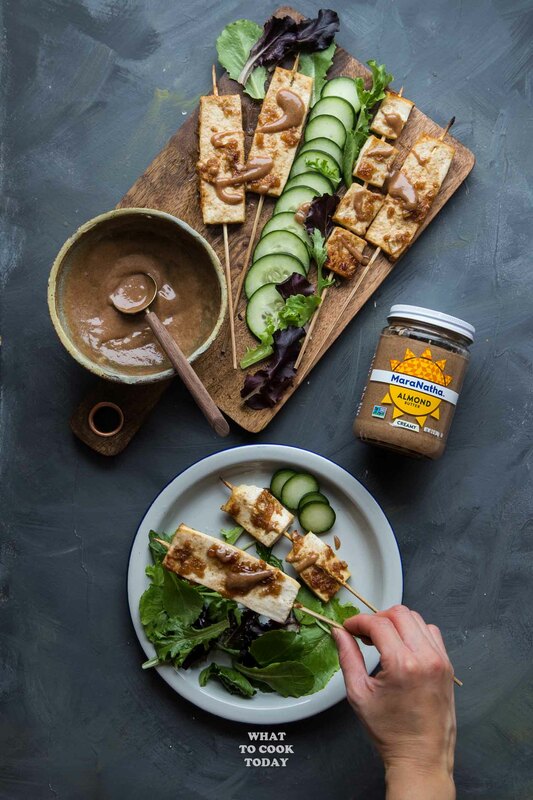 Tofu Satay with Almond Butter Sauce – Tofu is marinated in aromatic spices and serve with super easy, tasty, and creamy almond butter sauce. You will not think of tofu the same way again. I have been on a mission to get my family to eat a meatless meal more often and enjoy meat alternative like tofu. 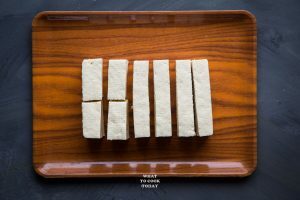 I grew up in Asia and so tofu was part of my life because it’s a very common ingredient used in home cooking. It’s also a great and cheap source of protein. My mom cooked it so often. My husband loves his meat and feels like a meal is not complete without it. 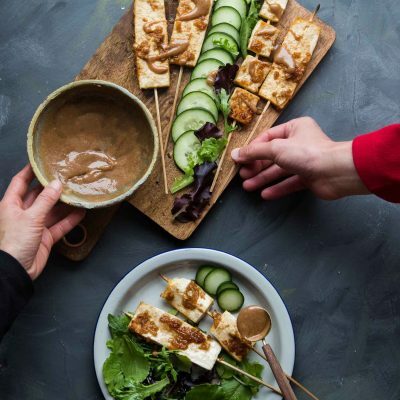 Of course, until I made this tofu satay with an almond butter sauce few days ago. 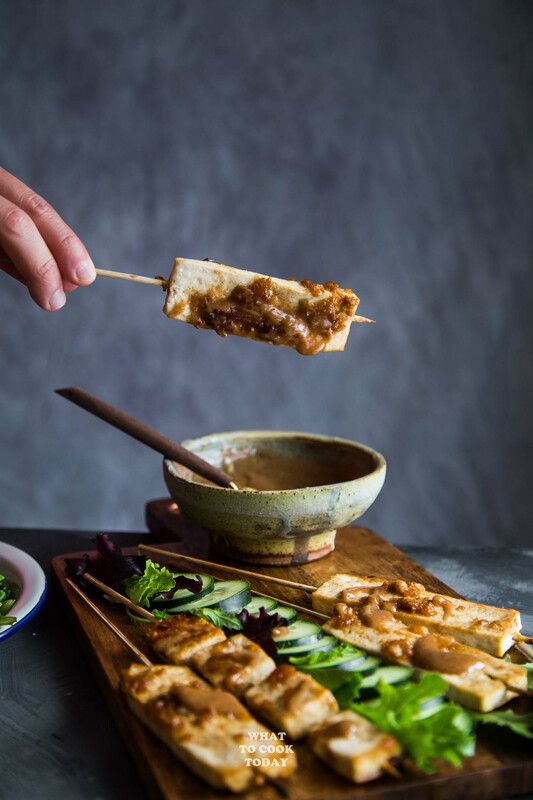 This tofu satay seriously gets his vote! Even the kids love it! The inspiration came from the popular satay dish that I grew up eating. 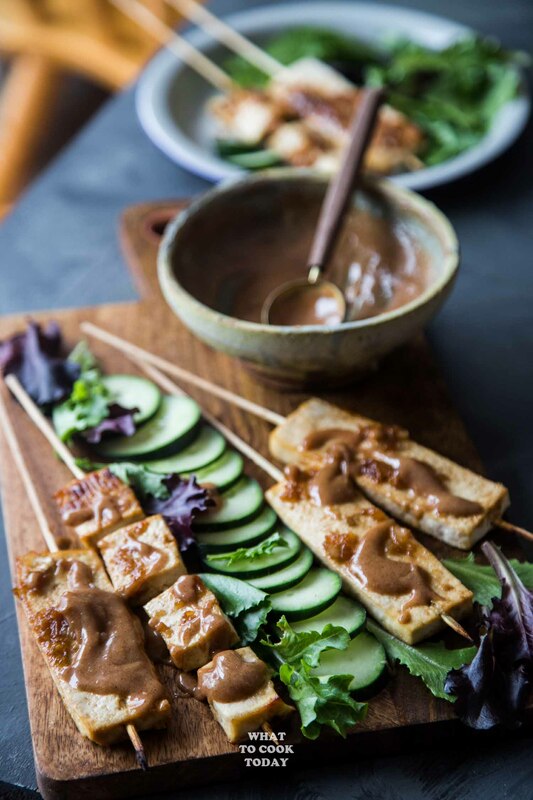 WHAT MAKES THIS TOFU SATAY WITH ALMOND BUTTER SAUCE SO GOOD! 1. Well, hello…the almond butter sauce! The family loved the almond butter sauce. The good news is, you don’t need to be grinding your own almond to do that. I used MaraNatha Creamy No Stir Almond Butter. It is no stir, so creamy, easily spread, and so delish!!!! You can also use MaraNatha Creamy No Stir Almond Butter too. There is no salt or additives added in this version, so you can enjoy the natural almond taste. 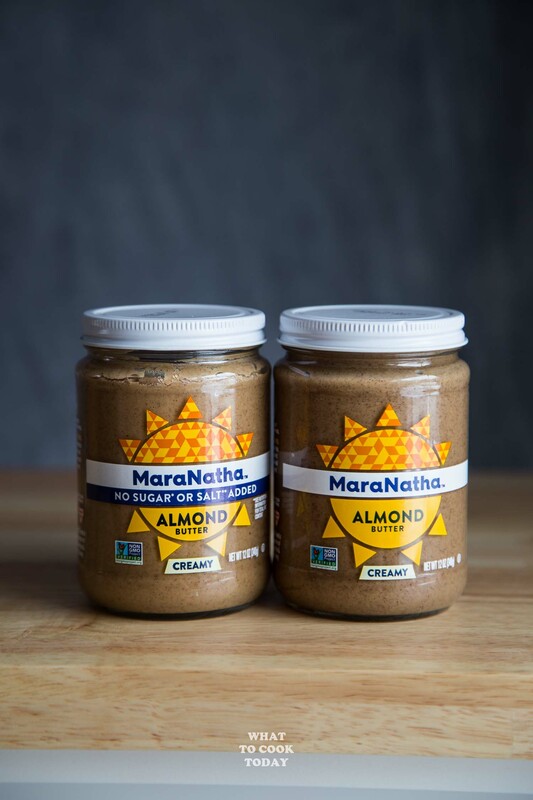 Hover over the image below and you will be able to click through to shop for MaraNatha Creamy No Stir Almond Butter and MaraNatha Creamy No Stir Almond Butter directly . 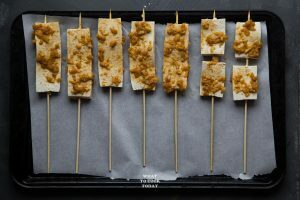 The marinade has onion in it and when baked with the satay will slowly caramelize and make the tofu satay tastes even better. There is also coriander powder in the marinade. My mom likes to add ground coriander in the satay and so that’s what I use in this tofu satay recipe. Even for those who dislike coriander leaves/cilantro leaves, you will like this. WHY? Despite coming from the same plant, coriander seeds that are ground into powder has an AMAZING lemony and sweet aroma that you will like and have different aroma altogether with the leaves. I’ve been hooked with MaraNatha Almond Butter ever since I knew about it a few years ago. 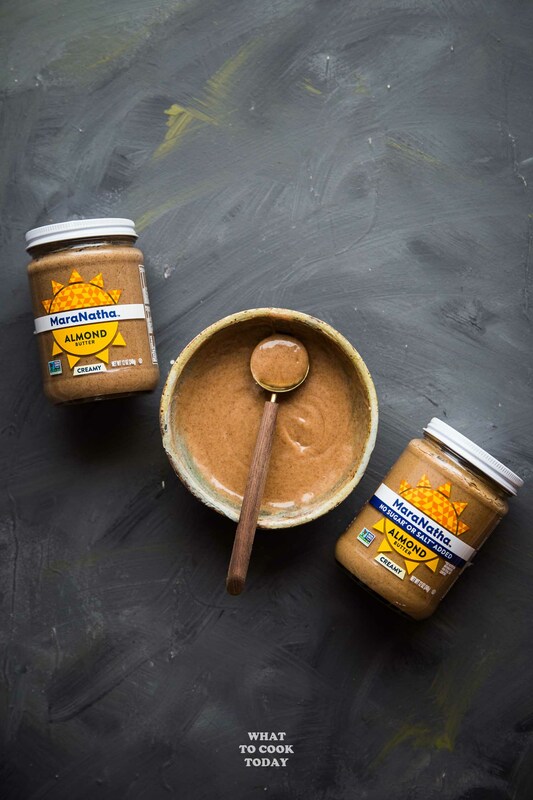 MaraNatha is the largest producer of high-quality nut butter in America. MaraNatha nut butter is made with high-quality California almonds, roast them to perfection and double-grind them to velvety smoothness. Now the No Stir Almond Butter gets even better! They can be enjoyed right from the jar! My husband and I like to have MaraNatha Nut Butter as a post-workout snack too. 4. Serve with refreshing cucumber and easy almond butter sauce. That’s it! MaraNatha No Salt or Sugar Added Almond Butter there. You can also earn a Cash Back with Ibotta offer. If you haven’t started a healthy relationship with MaraNatha No Stir Almond Butter or MaraNatha No Salt or Sugar Added Almond Butter as part of your healthy snack options, you should! 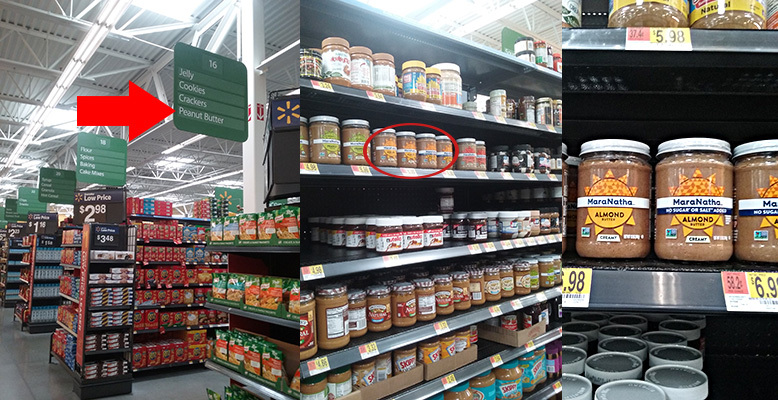 It is a better-for-you Nut butter with incredible taste! 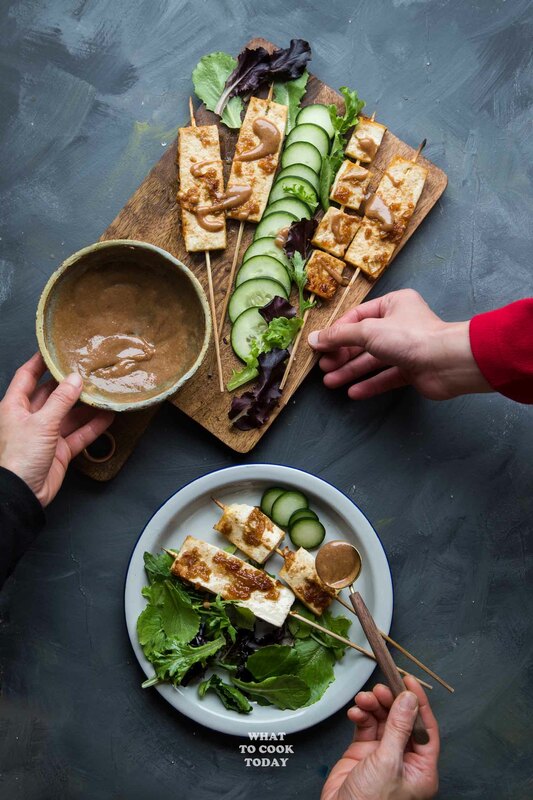 This tofu satay, for example, won’t be as exciting without the tasty almond butter sauce! What is your favorite recipe using almond butter? I would love to hear all about it! Tofu is marinated in aromatic spices and serve with super easy, tasty, and creamy almond butter sauce. You will not think of tofu the same way again. For presentation, you can line your serving platter with some lettuce or salad. 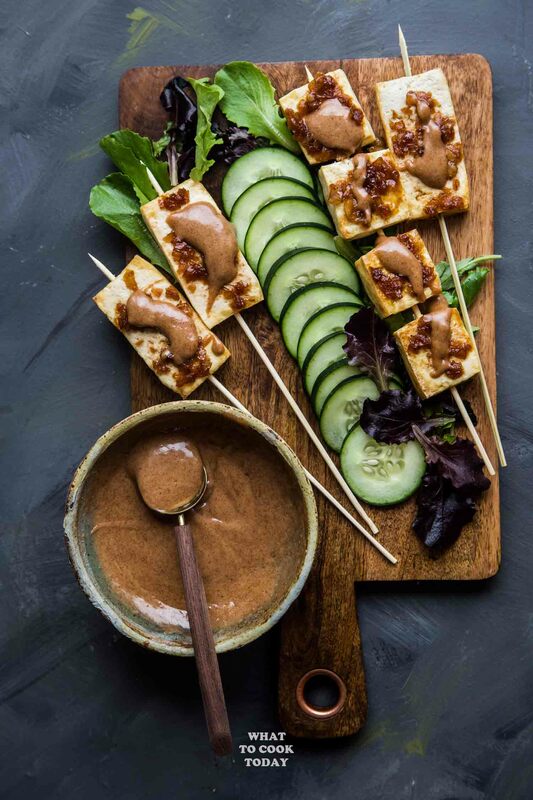 Place the tofu satay on top and slices of cucumber around them and serve with the almond butter sauce on the side and some drizzled on the satay. It's up to you. Oh my. This just sounds so delicious. I’m definitely no vegetarian, but I do have a love for tofu. If made right, it can have so much delicious flavor. Like in this recipe. That almond butter sauce sound divine! Totally pinned for later. I’ve got to make this! I’m with you too Danielle. I’m no vegetarian but I love tofu too.